Bires, A., L. Roininen, B. D. Yeshita, M. Nigussie, and H. Vanhamäki (2016), Study of TEC Fluctuation via Stochastic Models and Bayesian Inversion, Radio Sci., 51, doi:10.1002/2016RS005959. We propose stochastic processes to be used to model the total electron content (TEC) observation. Based on this, we model the Rate of change of TEC (ROT) variation during ionospheric quiet conditions with stationary processes. During ionospheric disturbed conditions, for example when irregularity in ionospheric electron density distribution occurs, stationarity assumption over long time periods is no longer valid. In these cases, we make the parameter estimation for short time scales, during which we can assume stationarity. We show the relationship between the new method and commonly used TEC characterization parameters ROT and the ROT Index (ROTI). We construct our parametric model within the framework of Bayesian statistical inverse problems and hence give the solution as an a posteriori probability distribution. Bayesian framework allows us to model measurement errors systematically. Similarly, we mitigate variation of TEC due to factors which are not of ionospheric origin, like due to the motion of satellites relative to the receiver, by incorporating a priori knowledge in the Bayesian model. In practical computations, we draw the so-called maximum a posteriori estimates, which are our ROT and ROTI estimates, from the posterior distribution. Because the algorithm allows to estimate ROTI at each observation time, the estimator does not depend on the period of time for ROTI computation. We verify the method by analyzing TEC data recorded by GPS receiver located in Ethiopia (11.6°N, 37.4°E). The results indicate that the TEC fluctuations caused by the ionospheric irregularity can be effectively detected and quantified from the estimated ROT and ROTI values. A paper was recently accepted for publication in the Journal of Geophysical Research Space Physics. It is a Reply to a Comment on the Grandin et al. 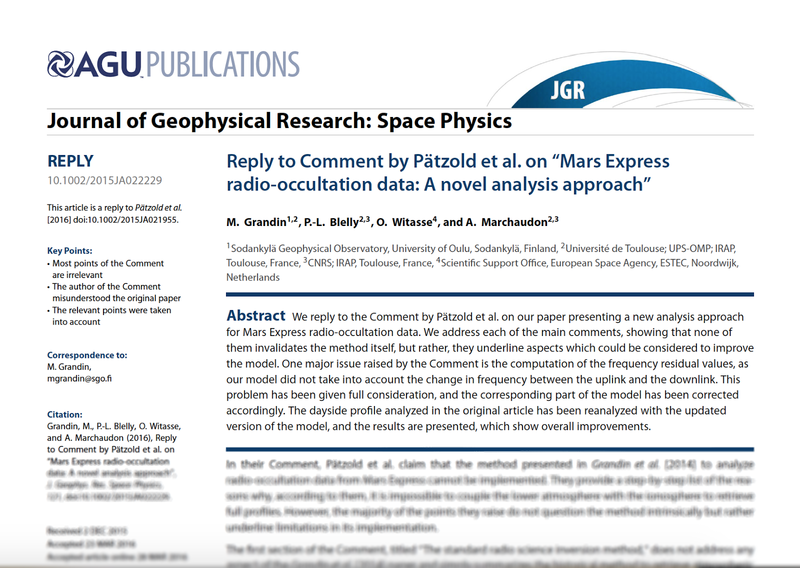 (2014) article introducing a new method to analyse radio-occultation data for Mars Express. The early view of this Reply can be accessed from the Wiley Online Library here. Grandin, M., P.-L. Blelly, O. Witasse, and A. Marchaudon (2016), Reply to Comment by Pätzold et al. on “Mars Express radio-occultation data: A novel analysis approach”, J. Geophys. Res. Space Physics, 121, doi:10.1002/2015JA022229. Below is the abstract of the Reply. We reply to the Comment by Pätzold et al. on our paper presenting a new analysis approach for Mars Express radio-occultation data. We address each of the main comments, showing that none of them invalidates the method itself, but rather, they underline aspects which could be considered to improve the model. One major issue raised by the Comment is the computation of the frequency residual values, as our model did not take into account the change in frequency between the uplink and the downlink. This problem has been given full consideration, and the corresponding part of the model has been corrected accordingly. The dayside profile analyzed in the original article has been reanalyzed with the updated version of the model, and the results are presented, which show overall improvements. Time for the traditional Finnish autumn EISCAT campaign! Ilkka Virtanen and I have been running radar experiments since last Friday evening, from the control room of the Ramfjord site near Tromsø, Norway. This is the site where the EISCAT transmitters are located: the VHF – which may be used alongside the Sodankylä and Kiruna receivers for tri-static measurements –, the UHF, and the ionospheric heating system (among other instruments). Four experiments from the Finnish EISCAT user community were scheduled for this campaign. 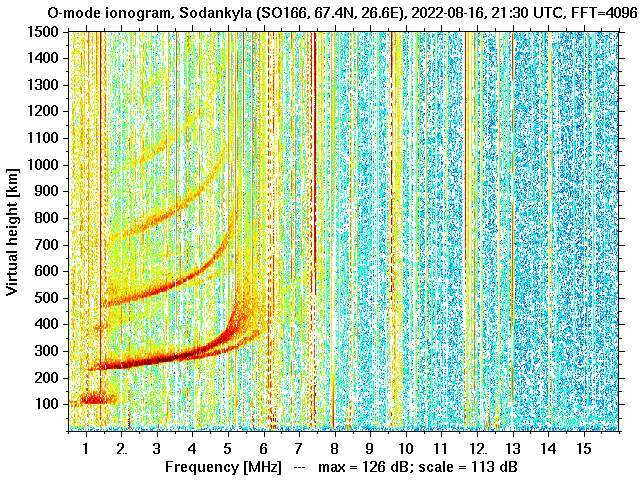 A first experiment consisted in a continuous 48-hour run of the EISCAT Svalbard Radar (ESR) during a solar wind high-speed stream. It was run in the beginning of this month, separately from the rest of the campaign. The second experiment aimed at using the UHF radar in a 3-position scanning mode to study neutral wind acceleration during auroral activity. The third experiment was supposed to use UHF, VHF, remote VHF receivers, ESR and the Kilpisjärvi Atmospheric Imaging Receiver Array (KAIRA) to cover SWARM satellite overpasses during two nights. 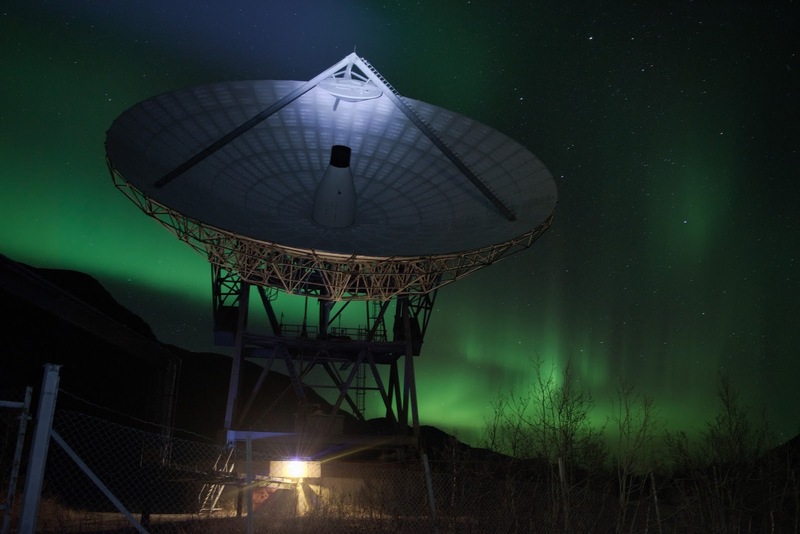 The fourth experiment was supposed to study the lower ionosphere during pulsating aurora, using the VHF system. Unfortunately, as this is often the case, reality reserves some surprises. In our case, these were not particularly good ones, since the KAIRA clock experiences some time drift, probably because its rubidium atomic clock needs to be replaced. Just to make sure that we have no regrets about it, the VHF is also down due to problems with a coaxial cable. As a consequence, the experiments using the VHF system could not be run as planned: the SWARM experiment only used field-aligned UHF measurements and ESR, and the pulsating aurora experiment had to be totally cancelled. As a form of compensation, we have been granted exceptional weather here in Tromsø – while on the Finnish side of the border, thick clouds offer an uninterrupted display of medium-grey and dark-grey. And at night, the aurora gave us several nice displays during the previous nights. Some form of compensation, indeed. The UHF radar, the aurora, and a mysterious beam of light. Today, M.Sc. Stepan Poluianov defends his doctoral thesis "Proxies for long-term cosmic ray variability" at 12:00 at the main Linnanmaa campus of the University of Oulu. Stepan Poluianov has used Oulu Neutron Monitor data of SGO under the supervision of Prof. Ilya Usoskin of SGO, who also serves as the Kustos (i.e. Chairman) of the defence ceremony. Congratulations from all of us at SGO! The University of Oulu is an international research and innovation university engaged in multidisciplinary basic research and academic education. The University of Oulu is one of the largest universities in Finland with 14,000 students and 3,000 employees. The University encompasses ten fields of study: Architecture, Biochemistry and Molecular Medicine, Humanities, Education, Economics and Business, Science, Medicine and Dentistry, Information Technology and Electrical Engineering, Technology and Mining. The University of Oulu researchers contribute to solving global challenges by combining multidisciplinary approaches, high level research and fruitful collaborations in the following five focus areas: 1. Creating sustainability through materials and systems, 2. Molecular and environmental basis for lifelong health, 3. Digital solutions in sensing and interactions, 4. Earth and near-space system and environmental change, 5. Understanding humans in change. Collaboration across scientific fields is strongly encouraged ad supported within the University. More information http://www.oulu.fi/english/. Field and Location: For strengthening its profile at international level the University of Oulu announces a tenure-track opening for researchers in Radio Science. Tenure track positions can be allocated to the career levels of the assistant professor, associate professor, full professor and distinguished professor. The positions are designed to promoting the careers of outstanding researchers and giving them the opportunity to gain further scientific qualifications in view of an academic career. The researchers appointed to a tenure track position may advance in their career through the tenure track process and be appointed to a permanent position as a professor or a distinguished professor. When recruiting for the positions, outstanding or world-class scientific quality is set as a requirement, and this must be verified via evaluations from high-level international researchers. 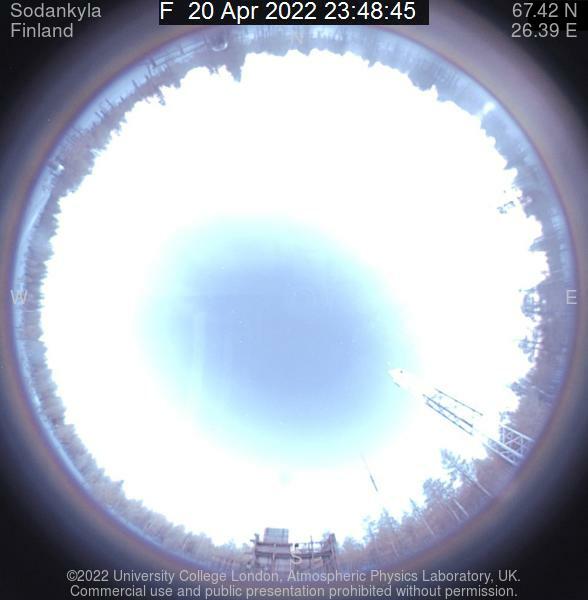 The position is placed at Sodankylä Geophysical Observatory (SGO, http://www.sgo.fi), a separate institute of the university located at Tähtelä, near the village of Sodankylä 350 km north of the main campus of the university. SGO carries out, as a national task of the university, geophysical measurements, development of measurement methods and empirical as well as theoretical research of both solid Earth geophysics and geospace environment. The long-term continuous observations cover measurements of Earth’s geomagnetic field, ionosphere, northern lights, cosmic radiation and seismic activity. An important activity is the development of measurement techniques and methods as well as theoretical modelling in the research fields. The research activities are based on international collaborations with more than 200 institutes worldwide. Scientists of SGO participate in 2 Centres of Excellence (CoE) financed by Academy of Finland, CoE in Mathematical Inverse Problems and CoE in Space Climate. SGO participates in EU projects and 2 European large scale research infrastructure (ESFRI) projects, EPOS and EISCAT_3D, coordinating the Finnish participation in the latter one. SGO carries out development of radio scientific instrumentation in its Radio Science laboratory, where currently several SGO’s measurement networks, such as the SGO riometer and satellite tomography are being renewed to latest software-radio based technology. The Observatory’s duties do not include regular teaching, but leading scientists are expected to supervise PhD students in the university’s research teams. The Observatory employs currently 30 persons. The tenure-track position in Radio Science is directed towards development of Phased-Array Radio techniques, measurement methods and related science applications in preparation to the use of the forthcoming next-generation incoherent scatter radar facility, EISCAT_3D. Currently available main instrumentation consists of the EISCAT incoherent scatter radars in Northern Fenno-Scandinavia and Svalbard (http://www.eiscat.se), and most importantly Finland’s largest radio telescope, the Kilpisjärvi Atmospheric Imaging Receiver Array KAIRA. KAIRA is operated by SGO and located in northernmost Finland at Kilpisjärvi near the border of Norway at Kilpisjärvi. Active collaboration using other similar instrumentation, such as the LOFAR system, especially in applications related to space weather, is expected. The position will start as tenure track from 1st March 2017, or later according to mutual agreement with the successful applicant. The researchers appointed to a tenure track position may advance in their career through the tenure track process and be appointed to a permanent position as a professor or a distinguished professor. After the start of the position we anticipate new financing to be in place both to continue and strengthen the research activity, when EISCAT_3D will be available for measurements. This position will be supported by a 2-year postdoc position directed to the same topic, to be opened in 2018 in SGO. Moreover, as part of our profiling measures, we will open another call in 2017 for a tenure position at the Faculty of Natural Sciences at the main campus in Oulu, for strengthening research on the geospace environment linked to the now open EISCAT_3D-related positions. Job Responsibilities and Required Qualifications: A person at any level of the academic tenure track system is expected to conduct outstanding world-class scientific research, to be competitive in attracting external funding, to publish in leading journals and conferences, to supervise SGO’s PhD students, to be an active member of the international scientific community, and to exhibit academic leadership. The job responsibilities also include the coordination of SGO’s KAIRA facility operations. Assistant Professor: The position of an assistant professor is for persons who have recently (less than ten years ago) finished their doctoral dissertation and are advancing towards a professional research career. The duration of the period is four years. The advancement assistant professor – associate professor – professor – distinguished professor is described in the University of Oulu Tenure Track guidelines: http://www.oulu.fi/university/node/38379. Salary: The salary of the appointed researcher will be based on the demand level chart for the teaching and research staff of Finnish Universities. In addition to the basic salary of the appropriate tenure track level, supplementary salary will be given for personal achievement and performance, the sum rising to a maximum of 46.3 % of the basic salary level for the post. The salary thus being roughly 3,500 – 4,700 €/month for an assistant professor, 4,100 - 5,400 €/month for an associate professor and 5600 - 8300 euros per month for a full professor. Other benefits: Finland is one of the most liveable countries, with a high quality of life, safety, excellent education system, and competitive economy. The successful candidate will receive full benefits provided by the University of Oulu to university employees, including free time corresponding to holidays and free occupational health care services. The successful candidate will receive also benefits provided by the Finnish government to residents, for example possibility to obtain access to the national healthcare system, tax benefits for employees with children and high-quality affordable childcare services. Applications: Applications, together with all relevant enclosures, should be submitted electronically by 11.11.2016. Please apply for the job using the link at the bottom of the official announcement. a curriculum vitae following the guidelines of the Finnish Advisory Board on Research Integrity (tutkimuseettinen neuvottelukunta). The guidelines are available at http://www.tenk.fi/en/template-researchers-curriculum-vitae and a template at http://www.tenk.fi/sites/tenk.fi/files/CV_english_270613.pdf. contact details of 2–4 persons available for recommendation. Contact details: In order to receive the information and announcements concerning the official selection procedures to be followed in order to fill this post, applicants must inform SGO of their contact details for the whole duration of the selection process: they must specifically provide both their home and work telephone numbers, e-mail addresses, fax numbers and postal addresses. Please apply for the job using the link at the bottom of the official announcement.